You don't need a weight room full of fancy machines to enjoy a killer leg workout. While there's certainly nothing wrong with mixing in a leg extension or press every now and then, the beautiful thing about working your legs is that it's exceptionally simple. Basic compound exercises, including squats, lunges, and deadlifts, target all the major muscle groups of your lower body using nothing more than dumbbells and barbells. If, however, you want the perfect lower-body workout that hits your legs at every angle, then these are the only four exercises you need. Front squats, just like every other squat, hit just about every muscle in your lower body -- your quads, hamstrings, glutes, calves, and even the stabilizing muscles of your hips and core. 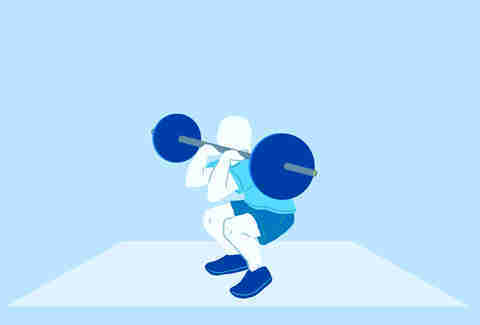 The beauty of the front squat, though, is because the weight is positioned in front of your body, there's more quadriceps engagement throughout the exercise. While traditional front squats use a weighted barbell positioned across the front of your shoulders, you can substitute a goblet squat in its place if you don't have access to a barbell. Stand tall with your feet roughly shoulder-width apart, your knees slightly bent, your toes angled outward. Position a weighted barbell across the front of your shoulders, holding it so your palms are pressing up, your fingers are at your shoulders, and your elbows are extended up and forward as much as your flexibility allows. Engage your core, and keeping your torso tall, press your hips back, lowering your glutes toward the ground as you bend your knees. Make sure you keep your weight in your heels and your knees aligned with your toes. When you've lowered your glutes as far as you can, press through your heels and return to standing. Perform three sets of eight to 12 reps. The three-way lunge may seem like a cheat, given that it's three different movements in a single exercise, but it's a damn good exercise for hitting your abductors and adductors in addition to your quads, hamstrings, and glutes. Using a weighted barbell (start with a light weight to get used to the exercise), you'll perform a front lunge, side lunge, and curtsy lunge in succession, always leading with the same leg, before repeating all four moves for the full set before switching legs. Trust me, your lower body will burn. Stand tall, your feet roughly shoulder-width apart, holding a lightweight barbell across the back of your shoulders. If you don't have access to a barbell, you can simply do the exercise while holding a set of dumbbells at your sides, or without weights in a pinch. Take a step forward with your right foot, planting your heel, allowing your left heel to come off the ground. Keeping your torso tall, bend both knees and lower your back knee toward the ground. Make sure your right knee is tracking in alignment with your toes. 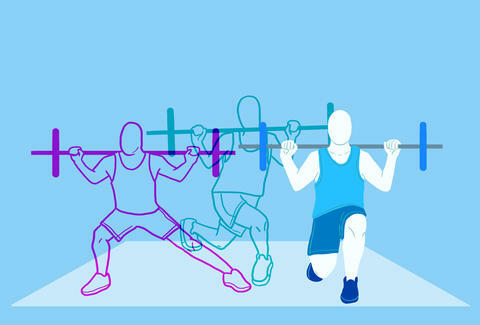 Just before your left knee touches down, press through your front heel and push yourself back to the starting position. Immediately transition to a side lunge by taking a wide step laterally with your right foot. Keep your left leg straight, and press your hips back while bending your right knee, lowering your glutes toward the ground. When you've lowered your glutes as far as you can while keeping your right knee aligned with your toes, press through your heel and return to the starting position. Now transition to a curtsy lunge by stepping your right foot diagonally behind your left foot, as if you were curtsying, planting the ball of your right foot on the ground. Keeping your knees aligned with your toes throughout this movement with your torso erect, bend both knees and lower your back knee toward the floor. Just before it touches down, reverse the movement and press through your left heel to return to the starting position. This front lunge, side lunge, curtsy lunge pattern counts as a single repetition. Perform six to eight total reps before switching legs. Complete two sets per leg. The stability ball hamstring curl targets your hammies without using a typical machine. Plus, it requires greater engagement of your core, glutes, and hips to maintain your balance. 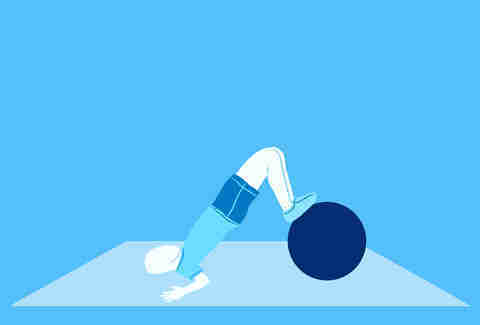 Lie on the ground and place your lower calves and heels on top of a stability ball, your legs fully extended. Place your arms along your sides, palms down, to help with balance. Engage your core and press your hips up so your body forms a straight line from your heels to your shoulder blades. Pressing your heels into the ball, bend your knees, rolling the ball toward your torso, all the while keeping your hips up, maintaining a straight line between your knees and shoulders. When you've drawn the ball as close to your body as you can, reverse the movement and extend your legs, pressing the ball away from you. That's one repetition. Perform two sets of 10 to 12 repetitions. 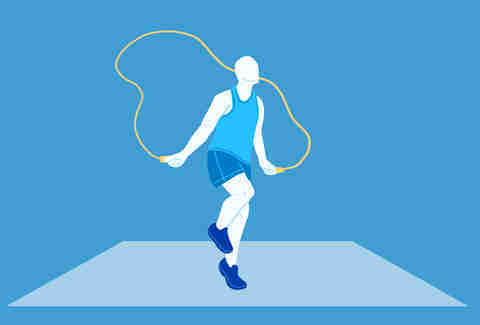 As fantastic as calf machines and calf raises are for building strong calves, it's hard to argue with the effectiveness of jumping rope as an easy alternative to traditional calf exercises. Jumping rope also raises your heart rate for a quick burst of cardio while challenging coordination and agility. And best of all? You don't even need a jump rope. You can always use a "fake rope" and simply hop in place while rotating your hands. The trick, of course, is that jumping rope is hard, and jumping on a single leg is even harder. Start by performing five sets of 10 hops per leg (100 total hops). You can alternate legs continuously for 100 consecutive jumps, or you can stop and rest every 10 hops as you switch legs. Laura Williams is an exercise physiologist and fitness writer whose jump-rope skills (and calves) are freakin’ amazing. All it takes is practice. Connect on Twitter @girlsgonesporty.